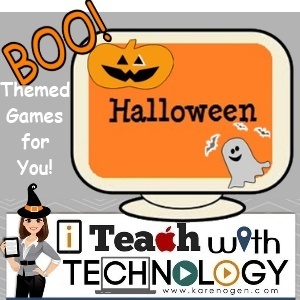 Karen Ogen- i Teach With Technology: Boo! Halloween Themed Games for You! It's the time of year when our students' brains are being clouded by thoughts of candy and seasonal fun. I can help you "trick" them into thinking they are getting a "treat" with this collection of over 40 (mostly) educational Halloween games. You will find an abundant selection of ghoulishly themed games that support learning for math, language, and logic. There is something here for every student from Kindergarten through 5th grade. If you have a student that doesn't celebrate Halloween, there are also Fall/Autumn themed games available.